Obama, Congress, and Syria: Arguments for and against the bombing resolution. There are 18 kinds of Syria bombing opponents in Congress, and 12 kinds of bombing supporters. Sens. John McCain (L) and Lindsey Graham (R) have expressed support for intervention in Syria. This piece has been updated since original publication to add to the list of members of Congress for and against Syria action. During the Cold War and for a period after the attacks of 9/11, a national security consensus existed between the two parties. When it came to foreign adventures, the president’s party would support him, and a significant portion of the opposition (sometimes a majority) would go along, too. This consensus has been fraying. On issues from President Obama’s use of drones, to the breadth of U.S. surveillance, to how to respond to the coup in Egypt, there is confusion, instability, and partisanship in Washington. It will help Islamists: “Who is on America’s side over there? If the rebels win, will they be American allies? Assad’s definitely not an American ally. 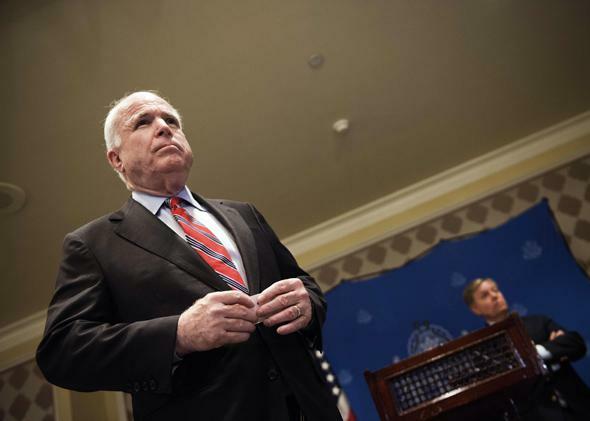 But I’m not convinced anybody on the Islamic side … will be American allies.” —Sen. Rand Paul, R-Ky.
Syria will be another Iraq: “We must learn the lessons of the past. Lessons from Iraq, Afghanistan, Libya, and others. …We must recognize that what happens in Syria does not stay in Syria; the implications for the region are dire.” —Rep. Barbara Lee, D-Calif. Chaos will ensue: “Beyond the potential for escalating the conflict and the killing, we risk danger to our ally Israel, involvement by the Russians and the Iranians, and blowback to the United States by radical groups operating in the region.” —Rep. Rick Nolan, D-Minn.
Americans don’t want it: “Americans don’t support war in Syria and neither does Congress. No clear U.S. interest or strategy. We don’t want entanglement in this war.” —Rep. Justin Amash, R-Mich.
Not in our national security interest: “After over a decade of war in the Middle East, there needs to be compelling evidence that there is an imminent threat to the security of the American people or our allies before any military action is taken. I do not believe that this situation meets that threshold.” —Sen. Joe Manchin, D-W.V. A strike won’t do anything: “If we’re not going to destroy or secure the [chemical] stocks, if we’re not trying to change the regime, if this is all about making a point—and not a particularly effective one at that—then that strikes me as a rather frivolous use of American military power.” —Rep. Tom Cole, R-Okla. Saving credibility isn’t a reason to attack: “The president has laid down his red line. Now I think he has to save face, so to speak, and shoot missiles into Syria.” -—Rep. Ted Poe, R-Texas. Can’t do everything everywhere: “What are the limitations on U.S. power. … At what point are we going to stop being responsible for all the problems in the world?” —Rep. Adam Smith, D-Wash., the ranking Democrat on the House Armed Services Committee. Evidence is weak: “Yes, I saw the classified documents yesterday. They were pretty thin.” —Rep. Michael Burgess, R-Texas, after a classified briefing on evidence of a chemical attack by the Syrian regime. Try more diplomacy first: “Every diplomatic option ought to be exhausted before the United States and its international partners contemplate any military action in the region.” —Richard Neal, D-Mass. You Break it You Bought it: “Military intervention would make it worse and make us responsible for that conflict.” —Rep. Chris Gibson, R-N.Y.
We’re going to inspire radicals: “How is American involvement not the fuel for the fire the Muslim Brotherhood and extremist are trying to ignite throughout the region?” —Rep. Robert Aderholt, R-Ala.
It’s against the law: “We do not have the authority under our Constitution or even under international law to get involved in a civil war in another country. ” —John Duncan, R-Tenn.
Opposed because there’s no draft: “For all of these excursions and intrusions militarily, if members of Congress thought for one minute that [the country would be] drafting their kids and their grandkids, you [would] not see this overwhelming sense of patriotism that you see.” —Rep. Charles Rangel, D-N.Y.
No support until sequestration is lifted: “”I will not support any funding request for an attack until the President acts to remove the burdens of sequestration from our military.” —Michael Turner, R-Ohio. No direct threat: “Not a single British citizen has been attacked and not a single American citizen has been attacked.” —Alan Grayson, D-Fla. It will make responding to Iran harder: “getting involved in Syria, after Iraq and Afghanistan, would make mustering our resolve to stop a nuclear Iran impossible.” —Sen. David Vitter, D-La..
Should have acted sooner: “Had we forcefully engaged in empowering moderate rebels, today we would have more and better options before us.” —Sen. Marco Rubio (R-Fla.) explaining why he voted no against action in the Senate Committee on Foreign Relations. We bomb and then what? “I’m concerned about the consequences of a military strike in Syria, and what happens with step two, three and four after that.” —Sen. Lamar Alexander, R-Tenn. The resolution needs to be narrowed: “The White House has put forward a proposed bill authorizing the use of force that, as drafted, is far too broad and open ended, and could be used to justify everything from a limited cruise missile strike to a no fly zone and the introduction of American ground troops” —Rep. Adam Schiff, D-Calif.
OK, but make it small: “Whatever action the United States takes, it has to be limited action. This can’t be an open-ended commitment, and it definitely should not lead to American boots on the ground.” —Sen. Al Franken, D-Minn.
Don’t want to embolden Iran: “Iran is watching to see how we handle this. Iran to see how we respond as a test of how we will respond if and when they create weapons of Mass destruction.” —Rep. Eliot Engel, D-N.Y.
Dictators are watching: “It sends a message to … the ayatollah in Iran. … It sends a message to North Korea about our determination to stop them from continuing to make the Korean Peninsula. It sends messages to terrorist groups seek[ing] access to chemical weapons, because the world will largely stand by when you use them.” —Sen. Robert Menendez, D-N.J.
It’s the American thing to do: “The United States, for our entire history, has stood up for democracy and freedom for people around the world…only the United States has the capability and the capacity to—to stop Assad and to warn others around the world that this type of behavior is not going to be tolerated.” —House Speaker John Boehner, R-Ohio. Supportive but irritated the president asked Congress: “[President Obama] is abdicating his responsibility as commander-in-chief and undermining the authority of future presidents. … The President doesn’t need 535 Members of Congress to enforce his own red line.” —Rep. Peter King, R-N.Y.
Avenge the children: : “This has nothing to do with politics,” she said, noting, “the images of babies lined up dead. As a mother I would want … a nation as strong as the United States [to] stand up for my children.” —Rep. Debbie Wasserman Schultz, D-Fla.
Must maintain norms against chemical weapons use: “People say, ‘Well, he killed 100,000 people. What’s the difference with this 1,400?’ With this 1,400, he crossed a line with using chemical weapons. President Obama did not draw the red line. Humanity drew it decades ago, 170-some countries supporting the convention on not using chemicals—chemical warfare.” —House Minority Leader Nancy Pelosi, D-Calif. The full Monty: “I believe the use of military force against Syria is both justified and necessary. I believe the United States has a moral obligation as well as a national security interest in defending innocent lives against such atrocities, and in enforcing international norms such as the prohibition against the use of chemical weapons. Assad must be held accountable for his heinous acts, and the world looks to us for leadership.” —Senate Majority Leader Harry Reid, D-Nev. Wanting More: “We cannot in good conscience support isolated military strikes in Syria that are not part of an overall strategy that can change the momentum on the battlefield, achieve the president’s stated goal of Assad’s removal from power, and bring an end to this conflict, which is a growing threat to our national security interests.” —Sen. John McCain, R-Ariz., and Sen. Lindsey Graham, R-S.C.
Be Loyal to the President: “[Democrats in Congress] just don’t want to see him shamed and humiliated on the national stage.” —Del. Eleanor Holmes Norton, D-Washington, D.C.